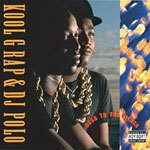 Kool G Rap and DJ Polo's 1989 debut album, ''Road to the Riches,'' is available again at long last, this time as a 4xLP set including 12-inch versions, remixes and instrumentals. All tracks are digitally re-mastered, and the deluxe gatefold sleeve includes a beautiful inner spread with all the lyrics and liner notes written by Fly Ty, Mr. Magic, George DuBose and The Kool Genius of Rap himself, plus additional photography by George DuBose. ''Road to the Riches'' has withstood the test of time, and will always be recognized as a cohesive project that demonstrates lyrical and production ability, as well as artistic chemistry. G Rap's knife-edged rhymes -- delivered with the hardest-sounding lisp in hip-hop -- tear through Marley Marl's productions and DJ Polo's scratching with all the ferocity of a pit bull devouring a piece of meat. Marl's imaginative sampling gleans from all sorts of unexpected sources, like the harmonica from Area Code 615's ''Stone Fox Chase,'' the odd phrasings of Kraftwerk's ''Trans-Europe Express'' (no one used it like this), and the burbling synths from Gary Numan's ''Cars'' (remember, this was the late 80s). This project has been thought out, done right and handled with care and we sincerely hope you enjoy it.